Christopher James Wood, bottle artist and collector who lives in Scottsville, Kentucky with his wife, Holly. His awareness and interest in bottle whimsies grew from his initial collecting of carved whimsies. He bought a large group of carvings which were obtained by the seller from the estate sale of a deceased whimsy carver which happened to include three completed bottle whimsies. Their method of construction was so puzzling to him that he was determined to learn and understand how they were made. Upon study, he found numerous wooden parts contained among the items which were found to be incomplete bottle whimsies and he set out to complete one of those projects. He took three fleurs-de-lis, only one of which was complete as each was to have 5 parts and added a couple of missing parts to the other two. 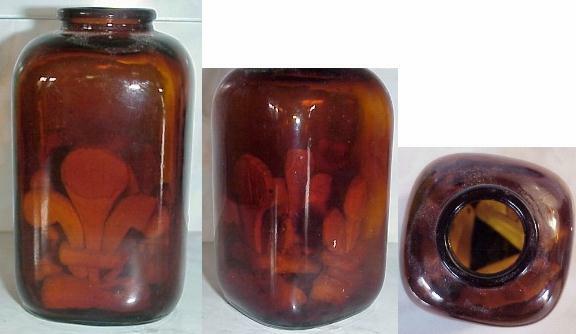 He then took them apart and reassembled them inside an amber snuff bottle (a poor choice he now admits). It took him about 3 hours just to assemble the three inside the bottle using only one pair of long tweezers and a coat hanger. Unfortunately, upon sawing the stopper this bottle crept off his work table and the bottle was destroyed. After a while to lick his wounds, so to speak, he found among the pieces an anchor made of many pieces and decided to replicate it exactly and complete his first bottle whimsy regardless of time or effort. He added a one piece wooden chain with 39 links to the anchor, topped the bottle off with a one piece ball in cage and after nearly 100 hours finished his first bottle whimsy the first week of December, 2002. Since that time, he has completed well over 20 bottle whimsies and finally put those three fleurs-de-lis together, but in a clear bottle this time. However, he still has not put the glue in to make that bottle permanent and for some reason feels he shouldn't ever complete it. He also has two bottles near completion "in stasis" as he puts it, and many more in lesser stages of development. As a collector, Chris has amassed an outstanding collection of bottles made by noted artists from all periods. 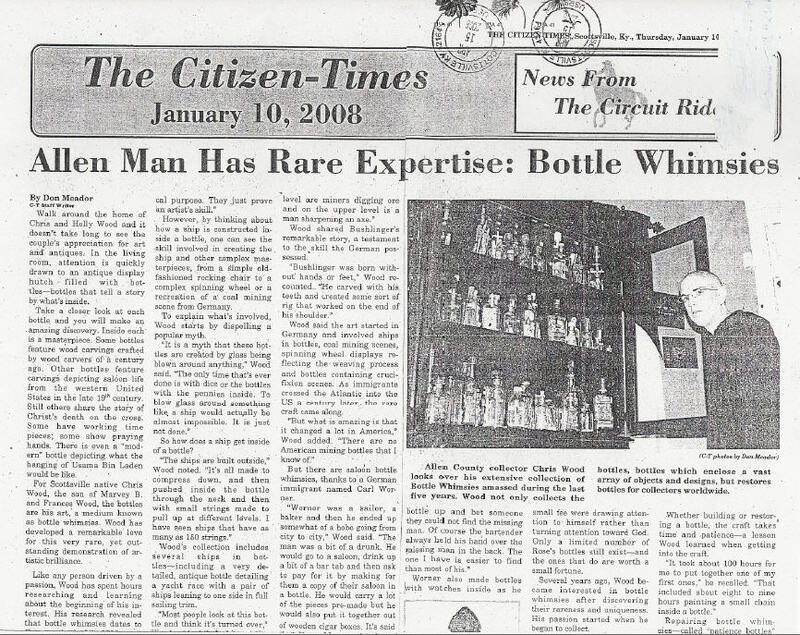 Many of his bottles have been resold to private collectors but he still has a wonderful personal collection. 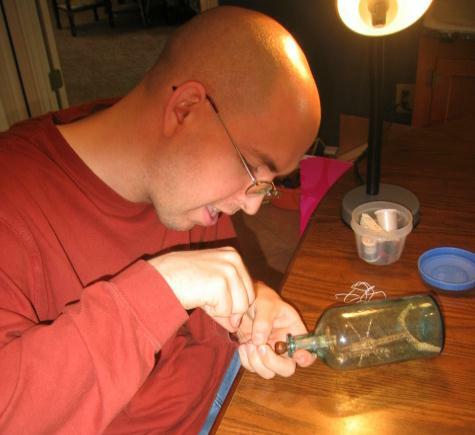 After buying many bottle whimsies and having them shipped only to have them arrive damaged 75% of the time, he has also learned how to repair and restore bottles. His restorations include everything from simple cleanings to complete reconstruction of "totaled bottles", as he calls them and even fabrication of missing pieces when absolutely necessary. The following article appeared in the The Citizens-Times, Scottsville, KY, in 2008. The following is a readable copy of the above article.